Traditional spinal surgery uses “open” surgical procedures in order to decompress and stabilize the spine. 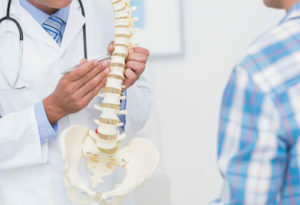 Minimally invasive spinal surgery requires smaller incisions with reduced damage to muscle tissue and, for some patients, minimally invasive techniques can offer shorter recovery times and less risk than traditional back surgery. Because of the location, accessing spinal nerves, vertebrae, and discs requires moving muscle tissue. In minimally invasive surgery this is done by making small incisions or by inserting small tubes that keep muscle tissue out of the way. Surgical instruments and cameras can then be guided to the area. Minimally invasive spinal surgery is a focus of The Spine Practice. Dr. Johnson has pioneered several key procedures and has been a leader in perfecting less invasive disc surgery and these procedures are often done in an out-patient and “same-day-surgery“setting or short hospital stay through the use of small incisions, microsurgery and nearly bloodless surgery in the cervical, thoracic, and lumbar spine. Dr. Johnson has also been an innovator in developing minimally invasive endoscopic thoracic spinal surgery that previously required a thoracotomy and large incisions to open the chest cavity and resulted in significant pain and morbidity from the incisions alone. He has also combined these procedures with pioneering computerized image-guided surgical procedures to create the most precision surgery available for these complex procedures.